Saudi frigate hit by suicide boats – taking a deeper look at the conflict in Yemen. Earlier this week, as reported by several news outlets, three Houthi “suicide boats” approached a Saudi frigate, which is part of the Saudi-led coalition battling Yemen’s Houthi rebels, west of Hudaya, Yemen. According to a statement by Saudi officials, one of the boats rammed the rear of the frigate and exploded, causing a fire, albeit later extinguished, as a result of the blast two crew members were killed and three others were injured. The attack puts the spotlight on an often overlooked conflict in the region. With all eyes fixated on the campaign against Islamic State of Iraq and the Levant (ISIL) in Syria and Iraq where Iraqi forces with the help of a broader coalition have just liberated the eastern portion of Mosul, the conflict in Yemen is often overshadowed. So what is even going on in Yemen? Who is fighting who and why? Yemen, located at the tip of the Arabian Peninsula bordering Saudi Arabia and Oman, is one of the poorest countries in the Middle East and is what is commonly referred to as a failed state. The country has been in a bloody civil war since March of 2015 and according to the United Nations between the start of the conflict and the end of 2016, close to 7,500 people have been killed, more than 40,000 injured and as many as 3.1 million displaced. On top of that, the conflict has triggered a humanitarian disaster in the country leaving 80% of the population in need of aid, with 14 million people suffering from food insecurity and approximately 370,000 children under the age of five suffering the risk of starving to death. Yemen is strategically important because it sits on the Bab al-Mandab strait, a narrow waterway linking the Red Sea with the Gulf of Aden, through which much of the world’s oil shipments pass. In late 2011, an uprising forced the country’s longtime authoritarian president, Ali Abdulla Saleh, to hand over power to Abdrabbuh Mansour Hadi, his deputy. Hadi took over the government, however he was facing some major problems, including attacks by al-Qaeda, military distrust, continued loyalty of many officers to Saleh, corruption, unemployment and food insecurity. In a nutshell Hadi’s government was weak and a weak government mixed with a poor, unemployed and starving population as history has shown is a prime mixture for civil war. In 2013, Yemen’s National Dialogue Conference came together to write a new constitution and to create a federal political system, however the Houthis, a Shia Muslim minority that had already fought a series of rebellions against the previous president Saleh, withdrew from the process because the conference intended to keep Hadi’s transitional government in place and to make matters worse, two Houthi representatives to the conference were assassinated. Fast forward to 2014, the Houthis seized the opportunity of the transitional government’s weakness, rose up and took control of the northern heartland of Saada province and some of the neighboring areas. The Houthis advanced further and by September 2014 took control of the capital, Sanaa. By January 2015, the Houthis grip of Sanaa was solidified and they surrounded the presidential palace and other key points effectively placing Hadi and his government under house arrest. Shortly after Hadi escaped to the southern port city of Aden. The Houthis and security forces loyal to Saleh then attempted to take control of the entire country, forcing Hadi to flee the country in March 2015. Although, Hadi and his government have since returned to Aden from where they are organizing their fight against the Houthis. Al-Qaeda, the Sunni Islamist group the West knows all too well, had a presence in Yemen since before the start of the conflict in 2015, commonly known as al-Qaeda in the Arabian Peninsula (AQAP). However since the conflicted erupted, al-Qaeda has used the power vacuum to advance its interests and launched several attacks on the Shia Houthi rebels, which al-Qaeda regards as infidels. ISIL also has a presence in the country and in December of 2014 announced the formation of a state, in Yemen. In March 2015, it claimed its first attacks in the country, which were suicide bombings in mosques used by Zaydi Shia Muslims. Reportedly the attacks killed more than 140 people. So in a nutshell one the one side we have forces loyal to the government of Hadi, which consist of soldiers loyal to Hadi and predominantly Sunni southern tribesmen and on the other side we have the predominantly Shia Houthi rebels supported by separatists and Saleh and his supporters. To make things more complicated as outline above jihadist militants from AQAP and ISIL have meanwhile taken advantage of the chaos by seizing territory of their own. While this covers all the internal players, with AQAP and ISIL arguably being somewhat external players, the list of external players even further complicating the situation in Yemen. Following the territorial gain of the Shia Houthis, Saudi Arabia and eight other mostly Sunni countries (the Coalition) launched an air campaign aimed at restoring Hadi’s government. The Coalition consists of Qatar, Kuwait, the United Arab Emirates, Bahrain, Egypt, Morocco, Jordan, Sudan and Senegal. By now several of these countries have sent troops to fight on the ground in Yemen, while others have only carried out air strikes. The Coalition has received logistical and intelligence support from the United States (U.S.), United Kingdom and France. The conflict between the Houthis and the elected government is seen as part of a regional power struggle between Shia-ruled Iran and Sunni-ruled Saudi Arabia. So while Saudia Arabia and its Coalition support Hadi, it is believed that the Houthis on the other hand are backed militarily by Iran. Iran has denied arming the Houthis, but according to the U.S. military it intercepted arms shipments from Iran to Yemen. Iranian officials have also suggested they may send military advisers to support the Houthis. As part of the borader U.S. campaigns against terrorists, the U.S. regularly launches air strikes on AQAP and ISIL targets in Yemen and has Special Forces on the ground fighting both groups. Despite the Coalitions air campaign and naval blockade, pro-government forces have been unable to push the Houthis from their northern strongholds, including Sanaa. The Houthis have since mounted attacks inside neighboring Saudia Arabia to retaliate against the Coalitions military intervention. To this day no side appears close to a decisive military victory and the conflict is likely to carry on for years to come giving organizations such as Al-Qaeda and ISIL the perfect breeding ground as we have seen in Iraq and Syria. U.S. conducting airstrikes in Libya – why the Obama administration went out with a bang. On the surface the press release by Pentagon Press Secretary Peter Cook on airstrikes in Libya from January 19, 2017 does not seem like anything out of the ordinary. In conjunction with the Libyan Government of National Accord, the U.S. military conducted precision airstrikes Wednesday night destroying two ISIL camps 45 kilometers southwest of Sirte. The ISIL terrorists targeted included individuals who fled to the remote desert camps from Sirte in order to reorganize, and they posed a security threat to Libya, the region, and U.S. national interests. While we are still evaluating the results of the strikes, the initial assessment indicates they were successful. This action was authorized by the President as an extension of the successful operation the U.S. military conducted last year to support Libyan forces in freeing Sirte from ISIL control. The United States remains prepared to further support Libyan efforts to counter terrorist threats and to defeat ISIL in Libya. We are committed to maintaining pressure on ISIL and preventing them from establishing safe haven. These strikes will degrade ISIL’s ability to stage attacks against Libyan forces and civilians working to stabilize Sirte, and demonstrate our resolve in countering the threat posed by ISIL to Libya, the United States and our allies. A press release like we have seen them many times before as the Obama administration is relying heavily on U.S. air capabilities in the fight against ISIL. In the context of what is going on in Libya the release also makes sense, the Libyan port city of Sirte, which had been held by ISIL fell last month after a long siege to the forces of the United Nations backed Government of National Accord in Libya supported by U.S. air assets. So the fact that some of the ISIL fighters fled to more remote camps 45 kilometers southwest of Sirte and are now targeted by American airstrikes there lines up with the overall U.S. involvement in the conflict. What is out of the ordinary though is the fact that the strikes were not conducted using drones or aircraft stationed in the region but were carried out utilizing two B-2 bombers which flew a 34-hour, round-trip mission from Whiteman Air Force Base in Missouri, supported by a total of 15 tanker aircrafts to refuel the bombers along the way. The use of the B-2 bombers makes the mission unique as the B-2 fleet rarely gets called into action. The strikes marked only the fifth time that they have been used in combat operations since they became operational in the 1990s. The previous four B-2 missions were in March 1999 during Operation Allied Force in Yugoslavia, in September 2001, in the opening strikes of Operation Enduring Freedom in Afghanistan, in March 2003, in the initial phases of Operation Iraqi Freedom and in March 2011 during Operation Odyssey Dawn in Libya to topple the regime of Moammar Gadhafi. The reason for the limited use of the B-2 in comparison to other aircraft can largely be attributed to the fact that most missions currently conducted by the U.S. can be carried out by aircraft that are much less valuable than the B-2 and cost significantly less to fly and maintain. The B-2’s main advantage over other aircraft is it’s stealth technology, a capability that does not seem necessary to conduct airstrikes against ISIL camps in Libya. So it is not surprising that the press release was supplemented by a press conference with Defense Secretary Ashton Carter, who had already given what was thought to be his final press conference before the new administration takes over the day prior and Pentagon Press Secretary Peter Cook. According to a U.S. Air Force spokesman, the two B-2 bombers dropped approximately one hundred 500 pound Joint Direct Attack Munitions (JDAMs), commonly referred to as precision-guided bombs. Additionally, the B-2 strikes were supported up by one MQ-9 Reaper unmanned aerial vehicle utilizing Hellfire missiles. Another official indicated that the mission was coordinated with U.S. special operations personnel working with local allies. According to Carter, “Initial estimates indicate that the airstrikes killed more than 80 ISIL fighters…”. No doubt the airstrikes are unique and while killing 80 ISIL fighters will be a huge blow for the group in Libya, the use of the B-2s seems to continue to stand out. While defense officials argued the B-2s were chosen to conduct the mission due to their large carrying capacity and their on target loitering time, they also did not deny that other aircraft could have been used. Carter brushed off speculation that the strikes were intended by the outgoing administration to send a message to Russia and China that the U.S. retained the ability to strike anywhere in the world on short notice, or to offset criticism by President-elect Donald Trump of U.S. military readiness. A possible explanation for the high importance of the target and for the use of the B-2s came just a couple of days later. Although unconfirmed, CNN and Der Spiegel (a German news outlet) reported, citing a U.S. official and a source close to Libyan intelligence, that the possible presence of terrorists linked to the Berlin truck attack, contributed to the decision to conduct the airstrikes. On December 19, 2016, Anis Amri from Tunisia drove a truck into a Christmas market in Germany’s capital, Berlin, killing 12. He managed to escape, however was shot bz plice four dazs later in Milan, Italy. ISIL released a video recored by Amri claiming he was acting on ISIL’s behalf. The reports echo what Carter said during the initial press conference on January 19th, “Importantly, these strikes were directed against some of ISIL’s external plotters, who were actively planning operations against our allies in Europe … and may also have been connected with some attacks that have already occurred in Europe”. Additionally, Germany’s Ministry of Interior announced last week that two Libyan cell phone numbers were flagged by the German foreign intelligence service”BND” for further investigation prior to Amri’s attack, drawing another line between the Berlin attack and the airstrike in Libya. If the airstrikes in Libya were actually aimed at targeting some of Amri’s connections and/or other individuals involved in the Berlin attack, it becomes clear on why the airstrikes were so important to the U.S., its European allies and especially Germany. However, no doubt the Pentagon and the administration does not mind if the use of the B-2s sends a reminder to possible adversaries that the U.S. can strike targets across the globe very quickly. Wich ultimatly echos what Carter said during the press conference on February 19, “The use of the B-2 demonstrates the capability of the United States to deliver decisive precision force to the Air Force’s Global Strike Command over a great distance”. U.S. commences airstrikes against ISIL – too little too late? In a move to counter the rapid advances by the Islamic State of Iraq and the Levant (ISIL or the Group) in northern Iraq and Syria, the United States of America (U.S.) increased its involvement in the conflict. On August 8th, 2014, President Obama announced the U.S. would commence to provide humanitarian aid to civilians fleeing the ISIL advance and would simultaneously initiate targeted airstrikes against the Group. ISIL has been spreading the Group’s sphere of influence throughout the region for months, driving back Iraqi Forces using speed and violence of action. As a consequence of the rapid advance and the Iraqi’s hasty retreat, ISIL was able to capture substantial amounts of Iraqi military equipment, including equipment provided by the U.S., such as, Humvees, Abrams tanks, M4/M16 rifles and M198 howitzers and other non U.S. provided hardware common to the region including T-55 tanks, T-72 tanks and RPGs. Using the captured equipment, ISIL was able to transform from the average “toyota pickup rebel group” in possession of Ak47s, RPKs and RPGs into a more serious fighting force. Iraq Forces who already struggled to deal with ISIL, now seem to have an even tougher time to counter the Groups offensives, in part due to the low morale and low training standards present across many units of the Iraqi military. Kurdish Pashmerga fighters in the northern provinces of Iraq were able to put up a stiffer resistance, in part because ISIL was focused on Iraqi Forces at the beginning of the conflict. Since the beginning of August, however, ISIL has changed course and launched a new offensive towards Erbil (ھەولێر), the capital of Iraq’s Kurdistan region. Aside from being the capital of Kurdistan, Erbil, is important because it is home to a U.S. Consulate and base to US military advisors assisting Kurdish and Iraqi Forces. Should Erbil fall to ISIL it would be a strategic blow to the Kurdish and Iraqi Forces as well as the U.S.
Additionally, last week ISIL managed to take Qaraqosh which is home to Iraq’s largest Christian community causing thousands to flee. ISIL also advanced onto towns home to the Yazidis, a minority group in Iraq, again causing thousands to flee their homes. Many are seeking shelter on nearby Mount Sinjar, however the people on top of the mountain are now facing starvation and dehydration if they stay or death by ISIL if they come down. 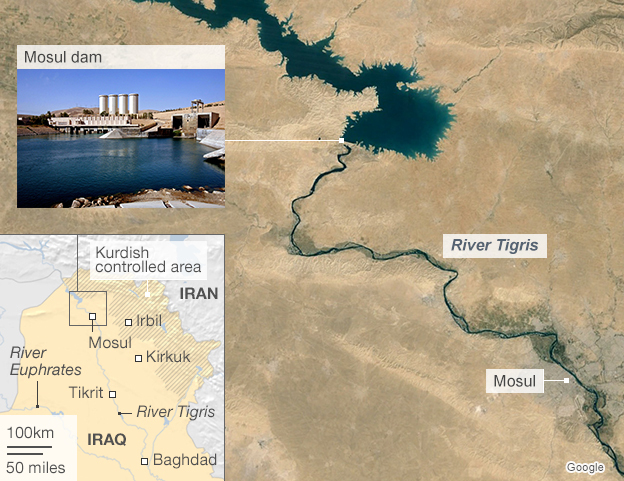 ISIL was also able to seize Iraq’s largest hydroelectric dam near Mosul. The dam is a key asset to control water and power in the area, with the Tigris River south of the dam running all the way to Baghdad. Over the last months, the Iraqi government has called for the U.S. to intervene numerous times as the country grew increasingly desperate. However, having just pulled its troops form Iraq and considering that a renewed involvement in Iraq is a tough sell to the American people, the Obama administration has been hesitant to get actively involved in the conflict. However, with the continuous military successes of ISIL, the destabilization of the region and in light of the human rights violations carried out during the Groups advances, it became clear that looking away would become increasingly difficult for the Obama administration. Consequently, on August 8th President Obama announced a humanitarian mission to help the civilians on the ground as well as a military operation to support Kurdish and Iraqi Forces. In his statement President Obama stated that the U.S. military is directed to conduct airstrikes against ISIL convoy’s should they move towards Ebil. Obama also said, “We’re also providing urgent assistance to Iraqi government and Kurdish forces so they can more effectively wage the fight against ISIL.”. This broad statements indicates that US operations will go beyond the narrow scope of only attacking ISIL forces headed for Erbil. However, Obama made specifically clear that the U.S. would not send combat troops to Iraq to directly fight ISIL. Shortly after the announcement by President Obama, the U.S. Navy conduced the first airstrikes against ISIL targets in northern Iraq. The video provided by U.S. Central Command shows two targeted airstrikes against ISIL targets. The first strike was carried out at approximately 06:45 EDT, when two F/A-18s attacked and destroyed mobile artillery pieces near Erbil using 500-pound laser-guided bombs. Later in the day four F/A-18s struck and destroyed a stationary IS convoy of seven vehicles and a mortar position also near Erbil. Additional airstrikes on ISIL targets have been carried out since and more are likely to follow. As outlined by President Obama, the U.S. has also launched a humanitarian mission under which the U.S. has conducted four airdrops to bring aid to the civilians fleeing from or trapped by ISIL. The above video shows an airdrop mission that included one C-17 and two C-130 cargo aircraft that together dropped a total of 72 bundles of supplies. The C-17 dropped 40 container delivery system bundles of fresh drinking water totaling 3,804 gallons. In addition, the two C-130s dropped 32 bundles totaling 16,128 meals ready to eat. According to Admiral Jogn Kirby the US has dropped more than 74,000 meals and 15,000 gallons of water during the four airdrops conducted thus far. Fourth airdrop completed to Iraqi's in need on Mt. Sinjar. More than 74k meals and 15K gallons of water now delivered. The question remains whether the military actions taken by the U.S. are enough to halt ISIL advances and/or to drive them back and ultimately dissolve the group. ISIL is currently using it’s heavy weapons to successfully soften defenses before swiftly attacking with motorized elements. This Blitzkrieg style of warfare has been highly successful against the ill prepared Iraqi Forces. If U.S. airstrikes are able to eliminate ISIL’s heavy weapons and motorized elements it will likely tip the balance of power to the Kurdish and Iraqi forces and should halt ISIL’s advances. While the US air support will give Iraqi and Kurdish forces a significant advantage, as seen in Libya, where opposition forces were able to cripple the regime of Gadaffi under the shield of western air superiority, US air support will have its limitations. The U.S. will likely be very careful when it comes to bombing ISIL targets in urban population areas where the risk of civilian casualties is high. The last thing the U.S. wants or needs is causing civilian deaths, further increasing anti American sentiment in the region. Additionally it has to be noted that ISIL will be able to draw supplies and resources from its operations in Syria an area that is currently out of the scope of U.S. air operations and therefore represents a quasi save haven for the group. Ultimately, previous operations in Afghanistan and Iraq have showed that a significant number of boots on the ground is necessary to permanently control and defend an area against insurgent groups such as ISIL. Consequently to drive back and/or eliminate ISIL Kurdish and Iraqi forces have to use the American air support to push forward on the ground.The U.S. is currently not likely to provide a significant number of ground troops due to budgetary constraints and the lack of support for “boots on the ground” by the American public. While American Forces are providing advisory support and likely have Special Forces as well as intelligence assets operating in Iraq their actual combat role will likely be extremely limited if possible. Iraqi and Kurdish Forces will have to fight the ground war largely on their own. Prolonged airstrikes should help the Iraqi and Kurdish Forces to dismantle ISIL in Iraq, however largely because the U.S. support came so late, this will take a long time and should be thought of in years rather than months or weeks. Even with airstrikes, defeating ISIL means to dismantle an ideology, which is a difficult task. All we have to do is look at Afghanistan, where more than a decade of ISAF did not manage to erode the Taliban. So the real questions is if Iraq will be able to find peace at all even after ISIL has been defeated from a military standpoint. The Kurds in the north are likely to demand independence from Iraq’s central government and other group may want the same. Iraq is a patchwork of religious believes and ethnic groups, finding peace even without ISIL will be a challenge. If one adds the tensions between Shia and Sunni groups into the equation, it becomes clear that Iraq will remain a volatile place even in a post ISIL world.